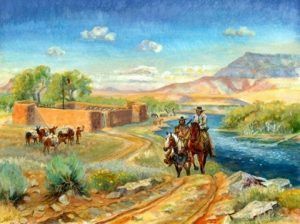 Not nearly as well known as the Oregon or Santa Fe Trails, the Old Spanish Trail was a contemporary of these two more famous trails, but was primarily a trade route rather than an emigrant trail, as the path was too rough for wagons. Put together with pieces of previous routes utilized by the Indians and explorers, this extension of the Santa Fe Trail from Missouri to New Mexico, connected Santa Fe with California, playing a major factor in the development of the southern part of the state. Approximately 1,120 miles long, it ran through areas of high mountains, arid deserts, and deep canyons through six states including New Mexico, Colorado, Arizona, Utah, Nevada, and California. One of the most arduous of all trade routes ever established in the United States, it was first explored as early as 1776, but would not see extensive pack train use until about 1830. 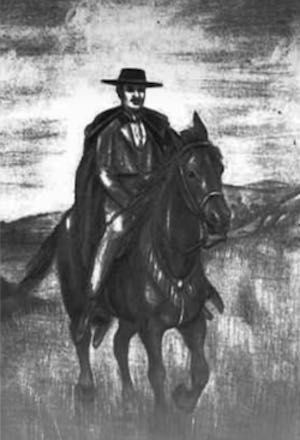 The eastern areas in southwest Colorado and southeast Utah were explored by Juan Maria de Rivera in 1765. Franciscan missionaries, Francisco Atanasio Domínguez and Silvestre Vélez de Escalante unsuccessfully attempted the trip to California, which was just being settled, in 1776, making it only as far the Great Basin in Utah before returning to Santa Fe, New Mexico. More missionary trips followed. The middle part of the trail through Nevada and California was worked out by trappers led by Jedediah Smith in about 1827. The trail was officially blazed in 1829-30, when Santa Fe merchant Antonio Armijo combined the information from previous explorers and led a trade party of 60 men and 100 mules to California. Word quickly spread about the successful trade expedition and regular trips began to be made by other traders. Some small-scale emigration also occurred along the trail as well as criminal activities including raiding California ranchos for horses, and for an extensive Indian slave trade. It was the first major thoroughfare across the American Southwest, and was described as “the longest, crookedest, most arduous pack mule route in the history of America.” Caravans usually left Santa Fe in the fall, when cooler desert temperatures prevailed, and returned in the spring when new grass was present to provide feed for the large herds of animals being driven eastward. A one-way journey might take from 1 ½ to 3 months. After the route had been in use for about 15 years, John C. Fremont, “The Great Pathfinder,” took the route, guided by Kit Carson, in 1844. In his report for the U.S. Topographical Corps, he officially named it the “Old Spanish Trail.” New Mexico-California trade continued until the mid-1850s, when a shift to the use of freight wagons and the development of wagon trails made the old pack trail route obsolete. The Old Spanish Trail officially lasted until 1848, when the territory it crossed became part of the United States. The Mexican War marked the official demise of the trail and after the war; the western portion of the trail was improved and made passable for wagons. The first passage by a wheeled vehicle was made in 1848, when a party of soldiers from the Mormon Battalion traveled from Los Angeles to the new Mormon capital at Salt Lake City. 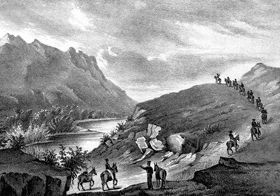 The road would continue to serve Mormons traveling between California and Utah, at which time, this portion was often referred to as the Mormon or Salt Lake Trail. Pack train leaving New Mexico. Portions of the old route continued to be used by pack traders until the mid-1850’s, by which time more improved roads had been blazed and freight wagons could be used. Beginning in the 1920’s and continuing sporadically through the following decades, various states and associations began to mark portions of the old trail. 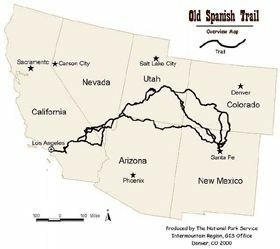 In 2002, Congress passed the Old Spanish Trail Recognition Act and today, is known as the Old Spanish National Historic Trail. Beginning in Santa Fe, this route looped northward through Colorado and Utah to avoid the deep river gorges of the Grand and Glen Canyons on the Colorado River before descending down across western Utah to Las Vegas, Nevada. From there, the trail crossed the Mohave Desert before making its way to the San Gabriel Mission near Los Angeles. The difficult route crossed two deserts and was often littered with the bones of horses and mules that had died of thirst. Trips were made only in the winter when water was more likely to be found in the desert regions. Traders traveled up the Rio Grande Valley from Santa Fe before heading northwest through northern New Mexico and crossing the Continental Divide and traveling to the San Juan River in Colorado. From there, the route continued across Colorado, passing near Mesa Verde and entering Utah east of Monticello. The trail then proceeded north through difficult terrain to Spanish Valley near today’s Moab, Utah. Those historic traders were surely amazed as they passed through the terrain near what are now Canyonlands and Arches National Parks, before making their way across the Colorado and Green Rivers to the southern part of the Great Basin and Mountain Meadows. Portrait is not of Antonio Armijo,but of Manuel Armijo.New Mexico governor before American Occupation. Thanks for catching that Eliseo! I’ve removed the image from this story and corrected it in our files.